Home > Lifestyle > Car Care > Don’t get stuck! Routinely checking tire pressure and inflating underinflated tires is one way drivers can reduce their risk of flat tires and blowouts. Varying wear: Tires should exhibit the same level of wear. The wear on front tires and back tires may differ, but one front tire should have the same amount of wear as the other and the same goes for the back tires. Uneven tread on tires indicates that the tire with more wear could be about to go out. Worn tread: Even drivers who know little about cars can typically recognize when tire tread has worn down to the point where the tire is a safety risk. But drivers who are unsure can employ the quarter test. Insert a quarter into the tread of the tire, with George Washington’s head upright. If you can see the hairline of the United States’ first president, then you need to replace the tire. Perform this test on each of your vehicle’s four tires. 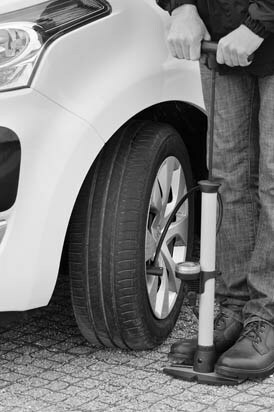 Low pressure: Drivers who do not routinely check their tire pressure are more likely to endure a flat or blowout than those who regularly make sure their tires are at the manufacturer-recommended pressure, which can be found in a vehicle owner’s manual or by calling the tire manufacturer or visiting their website. An underinflated tire is under stress that can cause the tire to blow out. In addition, poorly inflated tires force engines to work harder, which negatively affects a car’s fuel efficiency. Vibration: A car that vibrates excessively may do so because tires are damaged. Poor suspension is another cause of excessive vibration. Whatever is behind a car that is vibrating, drivers should immediately take the car to their mechanic for an inspection. Physical damage to the tire: Sometimes tires exhibit physical damage like bulges or cuts, and such signs could mean a flat tire or blowout is just around the corner. Tires that exhibit such physical damage need to be replaced immediately. Flat tires and blowouts can prove both scary and inconvenient. Drivers who want to avoid such problems should routinely inspect their tires for indicators that a flat or blowout is likely to occur.